NIMs will expand between 10bps to 20bps in 2018 led by rates rising benchmark rates. Digital capabilities will facilitate an increase in client-initiated transactions in the current upturn in economic cycle compared to past cycles. 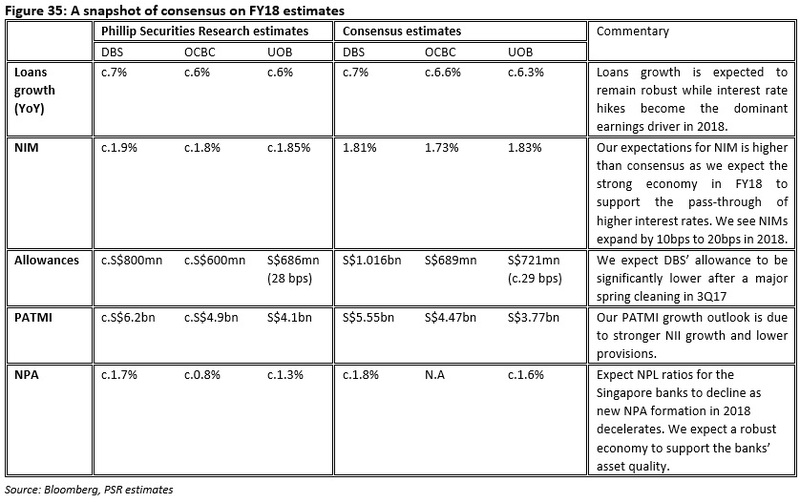 Singapore banks will comfortably achieve ROE of more than 10% in 2018 from higher volumes, better spreads and normalisation of credit cost. The 1H2017 saw improved market sentiments driven by the revival of “Animal Spirits” post Trump elections at the end of 2016. Singapore’s manufacturing PMI was picking up, but business expectations with the exception of the electronics sector remained subdued. Loans growth in Singapore was led mainly by mortgage loans. Competition was stiff as the banks were clamouring for higher quality loans amid continued weaknesses in quality within offshore oil and gas and SME loans. All in, NIMs growth was poorer in 1H2017 as pass-through of higher interest rates continued to be weak. However, 2H2017 saw a broad-based pickup of business expectations in the Singapore’s Services and Manufacturing Sector. The stronger business expectations were well supported by a synchronous pickup in economic activity across the globe. 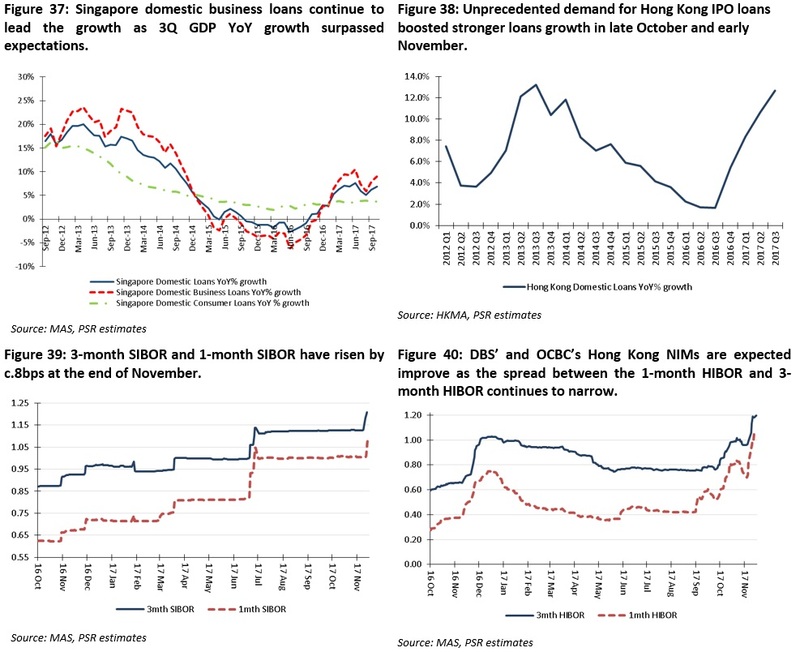 GDP growth of Singapore banks’ key markets in Singapore and Hong Kong also beat expectations in October. The stronger economy is critical for a firmer pass-through of higher interest rates and higher customer transaction activities. 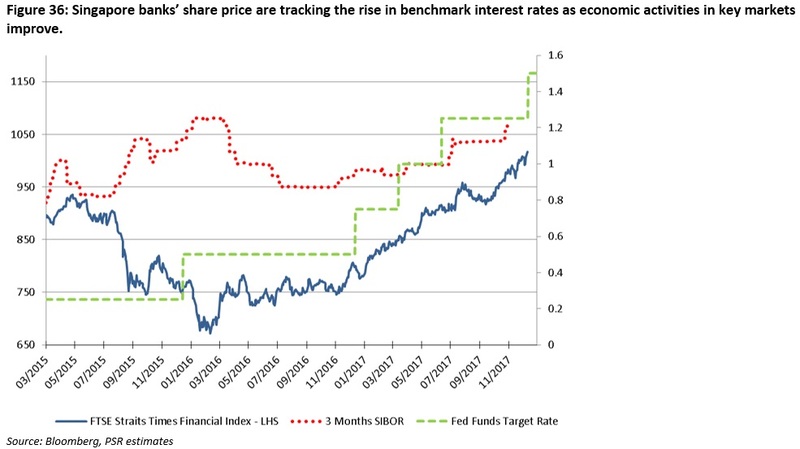 Evidently, the share price of the Singapore banks tracked the rise in benchmark interest rates in 2017 in contrast to the period in late 2015 when interest rates were rising amid poor economic sentiments. Despite the strengthening economy, the offshore oil and gas sector continues to be marred by low day rates as the travails of the oil and gas sector looks more structural than cyclical. 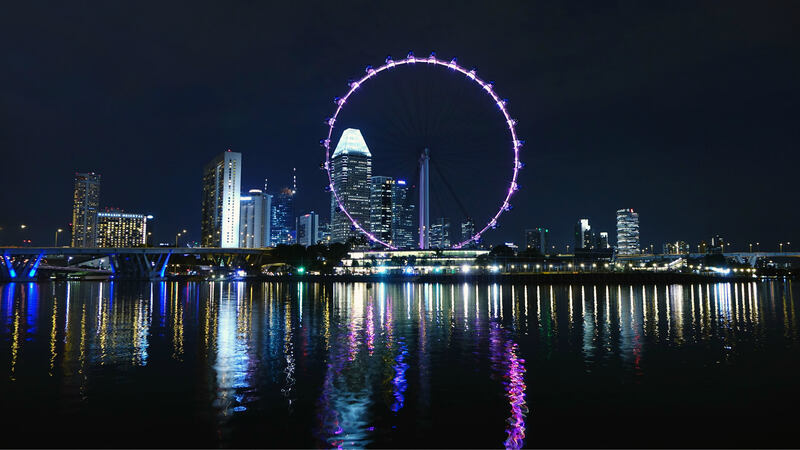 The Singapore banks’ specific provisions remained elevated in all three quarters of 2017 as there is no visible improvement to day rates. DBS initiated a spring clean of its oil and gas exposure in 3Q17 to eliminate as much uncertainty as possible in its balance sheet. We expect UOB and OCBC to follow on with some spring cleaning in 4Q17. We expect stronger NIMs because of firmer pass-through of higher interest rates. We expect strong pick up in client-initiated transaction volumes in corporate banking, SME banking and Wealth banking as the stronger economy encourages more business and investment activities. And we expect broad-based loans growth, in contrast with the mortgage loans led growth we saw in 2017. The stronger NIMs outlook in 2018 is shift from our expectations in 2017 as we expect strong contribution from rising of benchmark rates (ie SIBOR, HIBOR and LIBOR) which was largely absent in 2017. We also expect an increase in client-initiated transaction activities in this upturn in economic cycle compared to past cycles because of the availability of comprehensive digital platforms. Therefore we can expect better operating leverage as revenues from increased client activity rise faster than operating costs. We see the positive macro environment and availability of digital capabilities will push Singapore banks’ ROE comfortably above 10%. Our top pick is DBS because of its sizable exposure to Hong Kong (c.15% of on balance sheet loans). 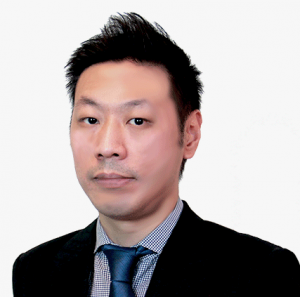 DBS will benefit from an increasingly vibrant capital market and a fast-growing wealth management business in that region. In DBS’ India digibank, we had previously proposed that the conditions are extremely favourable for DBS. And as key banking products are slated to be rolled out in 2018, the India digibank provides high visibility to DBS’ long-term growth prospects. Having a wide exposure to Greater China and India also means being exposed to fast-growing affluent and tech-savvy markets. DBS’ comprehensive digital capabilities will position it well to capture higher volumes of client-initiated transactions in these markets.